Here is a garden which is full of interesting features. Most of the level changes have had to be made using walls rather than banks because the plot is so narrow. The back of the house is in shade most of the time so I have created the main patio on higher ground away from the house. Walls and paving could be in almost any material as long as it all matches and is the same throughout the garden. The paving near the house will have to be drained in some way, but on the other terraces, good areas of soil will help to intercept and soak up the rain water. The two flights of steps up onto the main patio would be quite a novel feature and help to give good access when all the family are around. Planting between this patio terrace and the house paving needs to be low and spreading between the two flights but taller towards the sides. The patio could have a built-in barbecue with seating, or if the space is not needed for chairs and sun-loungers, a central water feature. The next flight of steps passes through a significant area of planting before coming out onto a smaller almost circular terrace. If the intention is to have similar paving running through the whole garden it will need to be able to pave angular as well as curved areas. The octagonal greenhouse would receive plenty of sunshine and the area beside it could be used for some salad vegetables or annual flowers. Wherever planting space is very limited, as it is between the two retaining walls along the boundary opposite the greenhouse, wall shrubs or climbers will have to be used to hide the walls and fences. The method of getting from one level to another changes at this point to a grass ramp, which is cheaper and easier to install than a flight of steps. The lawns are only partially levelled but retaining walls are still necessary against the boun­daries. If a swing or slide is wanted, then one area of lawn at least will have to be almost perfectly level. Beyond the grass bank the upper lawn has good-sized borders where, apart from shrubs, some soft fruit could be grown, particularly behind the seat and its planting. It is likely that, when sitting on this seat, the lower half of the garden will be all but concealed from view. With the help of the large planting area on the opposite side of the lawn to the seat (com­plete with its specimen conifer) the top part of the garden could become quite secluded and ‘away from it all’. Terracing of this garden will have to be planned very carefully on paper from reasonably accurate ‘level’ measurements. All the walls and steps should have deep foundations to guard against subsidence and construction could be quite expen­sive. Maintenance should be relatively easy — all the grass is at one end so that the mower would not have to be carried up and down steps. There is only one planned compost heap, in the top corner. 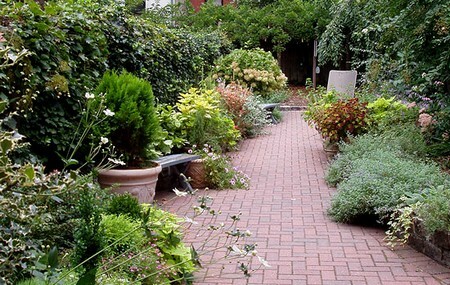 It would help, in such a long narrow garden, to have other points where garden rubbish could be accumulated. The back of the house will be the focus of attention from the main patio and possibly from the seat so planting on the rear wall will be very important, espe­cially if there are pipes and drains to disguise. Ivy and Hydrangea petiolaris succeed without sun and are self clinging. Some climbing roses, honeysuckle and Jasminum nudiflorum would also succeed but will require wires. Some shrubs in tubs would also help to soften the walls either side of the patio and the two corners next to the steps.